This is the first post in a series about trips coverage adjustments. This is a 1/4 1/4 1/2 concept. The Corner to the Trips is using Rattle technique. Rattle stands for Read Three. Corner is aligned 1x7 inside of #1 tilted. He is reading QB for quick game to #3. The FS is also using Rattle technique (reading #3). The FS is aligned at 10-12 splitting the difference between #2 and #3. His initial footwork is a controlled pedal. 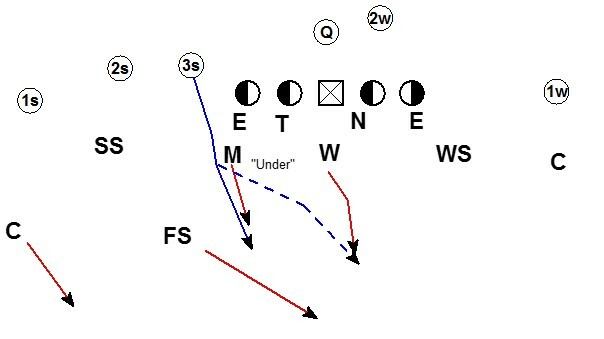 If #3 releases outside the FS will squeeze his coverage to #2, while the corner will squeeze outside to #1. If #3 releases inside or vertical the FS will work to the middle 1/3 and the corner will squeeze #2 in the seam playing the outside 1/3. The SS is aligned at 5 yards outside shoulder of #2 with a square stance. On the snap the SS will pop his feet and read through the EMLOS to the QB. His drop is SCiF (Seam-Curl-Flat). 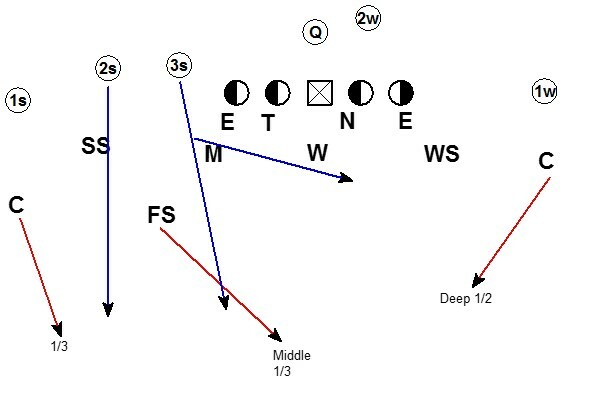 The SS has quick game routes to #2. 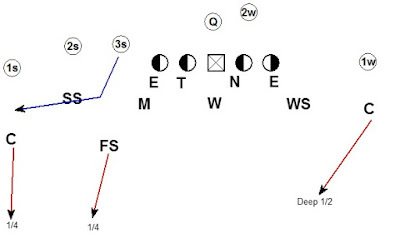 Against drop back pass if the #2 releases vertical the SS will stay square and collision #2. After collision the SS will pedal to a depth of 12 in the seam (2 yards outside the hash). While pedaling the SS will have his head on a swivel looking for the QB and receiving threats. If the QB tries to throw the ball on a line to #2 in the seam the SS should be able to make the play. The SS will expand to the Curl and Flat if necessary. If the #1 receiver is running a curl or in the SS should expand to cover him. The SS will only know to expand if he keeps his head on a swivel while pedalling. Also the Corner should give the SS an "IN" call. 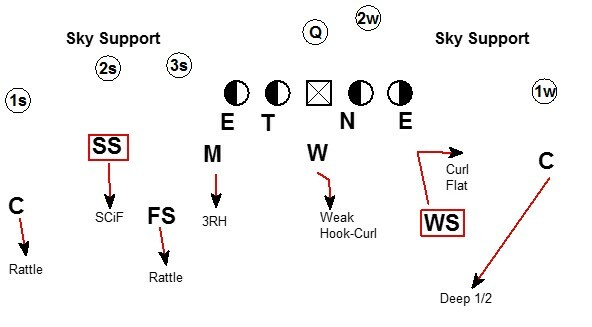 If the #3 receiver is releasing outside the 3RH dropper (here the Mike) makes a "Push" call. The "Push" call pushes the SCiF dropping SS from Seam to #1's Curl and he should be ready to break to the Flat on the throw. If #2 is inside immediately the SS will make an "Under" call and get depth in the seam. If #2 is outside immediately the SS will top the flat route expanding from the Seam to the Curl and breaking on the throw to the flat. 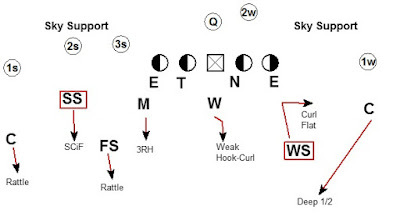 The Mike is a 3 Receiver Hook (3RH) dropper and drops in relationship to #3. The Mike has quick game routes to #3. If #3 is out immediately the Mike pushes the SS and expands looking for a route to cover coming back inside. If #3 is inside immediately the Mike walls #3. We rarely see #3 running a route deep enough to wall. Typically the #3 is running very shallow. If the #3 is under 5 yards the Mike calls "Under" and gets depth to 12 with his head on a swivel for new routes entering his zone. The Mike can pass the under because the Will is in the weak Hook-Curl and should be ready to break and tackle any throw to #3 on the under. If #3 is vertical the Mike collisions #3 if possible and will work to a max depth of 12. If #3 is vertical there will be a middle 1/3 safety so the Mike does not need to carry #3 vertical down the field. If #3 tries to work to the backside hash the Mike will wall him. The Will is in the weak Hook-Curl to force the ball over the top where the FS and the backside Corner should have a play on the ball. Those are the strong side drops. 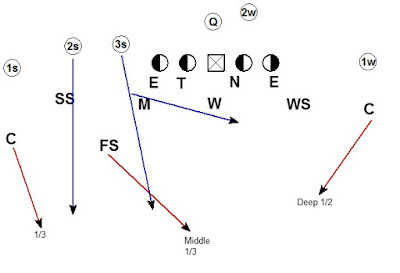 The next post will focus on Rattle coverage vs. common 3x1 strong side route combinations. How do you teach your backside corner? Is he reading as he drops, if so who? Or is he simply running to hash and and getting in his pedal? He is in a crossover run to a landmark, halfway between the hash and the numbers (NCAA field markings). While he is working there his head is on a swivel between #3 strong and the weak #1. If both are vertical he will work his landmark to divide the verticals then get eyes to QB. If only one is vertical he will squeeze off the landmark to the lone vertical and get his eyes to the QB.